Overview - From director David Fincher (Fight Club) comes the psychological thriller about two detectives on the trail of "John Doe," a serial killer who chooses his victims according to the seven deadly sins. Film fandom is all about passion. Take one look at the HDD forums to see thousands of posts where folks argue the cinematic qualities of their personal favorites or most loathed movies. But why so much enthusiasm? Why do people solidify friendships or start rivalries based on a collective love or dislike of a particular genre, director, actor, or flick? I think because at their core, films succeed or fail as emotional experiences. That's to say, working both consciously and subconsciously thematics, they speak to us -- change us -- and sometimes we don't even know it. David Fincher's 'SE7EN' much like Kenneth Branagh's Shakespeare helped to instill my passion for movies. Little did I know within a few short years, I'd be working for Arnold and Anne Kopelson, the Academy Award winning Producers behind 'Platoon', 'The Fugitive,' and of course Andrew Kevin Walker and David Fincher's thrilling genre-changing masterpiece, 'SE7EN'. Working as an assistant in Hollywood is neither as fancy nor as terrible as one would believe. Anyone with a hard work ethic can do it; sometimes you don't even need that. One of the better assignments during my tenure was closing out a company storage locker. In moving box after box (after box), I hit a mother lode of script drafts and one box of ancient pan-and-scan VHS 'SE7EN' dailies. The tapes were murky, rough, and not mine to keep, but the 'SE7EN' shooting script is among my favorite Hollywood treasures. 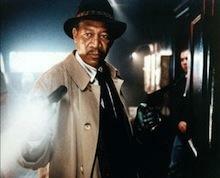 In a nameless, rotting city, a cold and lonely place where it always rains, Detective William Somerset (Morgan Freeman), a brilliant inquisitive veteran with one week left on the job, teams up with Detective David Mills (Brad Pitt), an enthusiastic young transfer, to stop a ticking-clock series of grisly murders inspired by the Seven Deadly Sins as well as the classical works of Dante, Milton, and St. Thomas Aquinas. A simple, high concept, yet the rest is history. A critical and commercial blockbuster, 'SE7EN' changed the genre forever, ushering in the era of the Killer With a Message (see the 'Saw' franchise) and even allowing for graphic crime scenes depicted on modern television procedurals like 'C.S.I.'. The script by Andrew Kevin Walker takes every genre cliché and brilliantly twists it. One actor in particular loved the material so much he agreed to take his credit at the end of the movie so his name wouldn't spoil the secret of his character's revelation. David Fincher, now heralded as a genius, had only made one film prior ('Alien 3'), but here knocks it out of the proverbial park, orchestrating the escalating tension. The cinematography is unbelievable dark and compliments Howard Shore's foreboding and unusual musical score. Welcome back. See? Amazing, right? Presented on one dual-layer 50GB Blu-ray disc, I'd just like to thank Warner Bros. Home Entertainment for not giving us forced trailers. Popping the disc in takes viewers quickly to a very simple home screen. Repeated viewings bring the audience back to where they last left off (it's always nice when a Blu-ray can have functionality as good as a DVD). The menus are easy to navigate, though it would have been nice to also include the commentaries in the language menu as well as the special features menu, but like most Blu-rays, all menus are fully accessible on the fly. 'SE7EN' arrives on Blu-ray with a near perfect VC-1 1080p (aspect ratio 2.40:1) transfer. Warner Bros. is building a strong name for itself in catalog titles, and 'SE7EN' is among its finest. This is a transfer that exudes its original source. There is no evidence of edge enhancement or noise reduction.The film's grain structure is constant, remaining film-like and smooth here on video. Contrast is exemplary.The film has very few bright moments of course, but its muted color pallet of a cold, rainy world is drenched in oozing shadows. I've never seen this many versions of darkness before, except in a black and white film. From inky black to grey, there's detail everywhere: droplets of rain on Morgan Freeman's coat, fine wisps of hair on Gweneth Paltrow's neck as she sleeps in bed, doggie foot prints on apartment door windows, costumes, sets. There's no banding, no noise, and very few flaws -- found with extreme nitpicking: specs of dirt here and there, a few softer shots, and an odd yellow-ish vertical band on the left side of the screen which appears next to Brad Pitt towards the end of the climax -- that the filmmakers didn't intend; clearly anytime there are titles on screen, the words themselves and sometimes the images underneath them have been made to look "damaged." As I was too young to see 'SE7EN' theatrically, this is the best I've ever seen the movie, from VHS, to the two North American DVDs, and even on HD cable. There is simply no comparison. An amazing upgrade where the film's clarity and shades of darkness complement one another wonderfully. 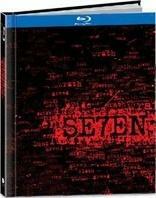 Warner Bros. Home Entertainment brings 'SE7EN' to Blu-ray with a jaw-dropping English 7.1 DTS-MA soundtrack. This is one of the most aggressive, consistently active surround mixes I've ever heard (especially compared to other tracks of the mid '90s). The film's constant feeling of dread and trepidation is in some scenes wholly created by the sound effects and Howard Shore's haunting score. Every scene builds sonically until it climaxes, and each sequence builds on top of that, until the last act is nearly unbearable. Every channel gets a fully discrete and directional workout, panning forwards and backwards, left and right. Dialogue is mixed evenly and nicely, but sometimes the background sounds are so engaging you want to listen to them more. There's literally always something moving -- a ringing phone, a car driving by, a typewriter clacking. It's like being inside this world. LFE fans will enjoy not only the general low-end presence in the helicopters and music, but your living room will shake when the train shakes Mills' apartment during the dinner scene. Additional audio selections include Deutsch, Castellano, Espanol, and Portugues, but non are lossless. For subtitles, one gets English SDH, Espanol, Deutsch, Castellano, Portugues, and a few others listed in those languages which I do not know, and are not written on the box. As the note will say the first time you activate them, all the special features are ported over from the 2000 Platinum Series double-disc edition of the DVD. While advanced for 2000, most of them are presented in SD and have been "enhanced" for this Blu-ray, whatever that means. 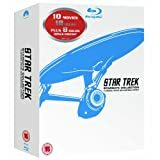 This is really a nice collection, and though it would have been perfect to have it all in high-def, it's understandable as to why a fifteen year old film that has been on DVD for ten-plus years didn't have materials readily available. Collectors, please know that the DVD-ROM content, including a printable version of the original screenplay, appear to be the only features left off that Platinum Series release. audio commentaries. Four in-depth commentaries are available, each tackling a different technical aspect of the filmmaking process: The Stars, The Story, The Picture, and The Sound. still photographs and production designs. Theses are galleys of pre-production and production storyboards, as well as some short featurettes on the photographs used in the film, like Victor's (Sloth) decomposition and the 8 minute documentary on John Doe's notebooks. deleted scenes and extended takes (SD, 19mins). Eight scenes available with optional commentary. alternate ending (SD, 13mins) There are two versions of the ending, the original "test" ending and an un-shot version with storyboards, both available with optional commentary. audio options. English Stereo, English Dolby EX, DTS ES, English 24/96 stereo, or two commentaries. Again, it's too bad these don't include the brand new lossless formats available on Blu-ray discs. theatrical EPK (SD, 7mins). New Line's 1995 EPK for the film's original release. mastering for the home theater (SD, 23mins). Watch three scenes with commentary by the artisans who are adjusting the audio, video, and color correction for the then-new 2000 DVD master. telecine gallery. Watch three scenes from the film with either A) the original video master or B) the one created for the 2000 DVD, and then chose A) the original theatrical 5.1 mix or the B) the revised 5.1 mix. This would have been extra awesome if they had added the Blu-ray master and mix to this equation. 'SE7EN' is a perfect thriller, a modern masterpiece that exists within genre conventions and then blows them all up. I had the privilege -- many years later -- of getting to know some of the people involved with its creation, which only fueled my passion for this particular movie. For fans of the film and owners of the previous DVD, this is an easy recommendation. The video is just shy of perfection, and the audio is reference. Special features wise, you're getting everything from 2000, save for some DVD-ROM content. For anyone who has never seen this film, again, go buy it. It's great in home theatre, and something (unless the kids are around) one can watch it again and again. BUY! BUY! BUY!